But after Daisy's close friend Cyril doesn't show up for his photo shoot and the calendar photographer is found dead, it's beginning to look like the days may be numbered for the men of Millbury. Can a cryptic verse on an antique sampler help Daisy pin down the killer before another pinup runs out of time? "Price continues to deliver a great story, peopled by fun characters you'd like to meet and make your friends. History is woven into the storyline without inundating the reader with facts all in one lump. It all comes together, just in time for the holidays, with a satisfying ending I didn't see coming." "Lie of the Needle is a charming addition to this intriguing mystery series and I enjoy spending time with this fun cast of characters. The mystery in this story was very complex and I love the fact that I had no idea who it was until the great reveal. In this story, we also get updates on the lives of secondary characters and love is definitely in the air in the small town of Millbury." "Price's newest story in her Deadly Notions Mystery series is another hit. She provides a background of small town life, friendships and the realization that even people you know may have some secrets. 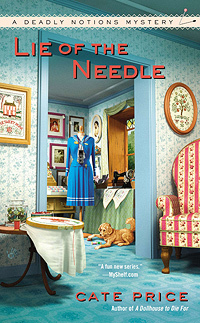 Lie of the Needle is a fun read and a good mystery that keeps you guessing until the end. Stitchers will love the detailed information on samplers and there are even a few recipes in at the back of the book. A great read!" "I love Daisy. She's such an awesome cozy heroine. What an on the edge of your seat story! The author sure knows how to build suspense. This is a great addition to anyone's cozy library." "A series that features creative tips for vintage notions was enough to pique my interest. I hadn't read the first two but now what can I say—I'm hooked. Daisy Buchanan is a strong heroine and the mystery is a good, solid read which kept me guessing—not easy to do. A definite must read!"